In 1958 a whole country mourned the premature death of almost the entire glorious Manchester United football team, all of them perishing in a plane crash near Munich while on their way back from a match in Belgrade. Some seventeen years later, the British motorsport fraternity was confronted with a similar tragedy, as the Embassy Hill F1 team - Brise, Graham Hill, and four team members - lost their lives in another plane crash. Ironically, Tony Brise was given his F1 break in a race which would be equally tragic to the Spanish in terms of fatalities: this was the race Rolf Stommelen led for Hill before going off through the sloppily fixed Armco to kill four spectators immediately behind it. In a move of yet even more subtle irony, Brise was then called upon to replace the hapless German. This was after just one race for the Williams team, in a season Frank was on an all-out attempt to give his cars to as many drivers as possible. In that respect, Williams wasn't necessarily surprised to see Brise go to Hill. But in hindsight, just a couple of months further down the road, he must have lamented Tony's departure in the same way Eddie Jordan still mourns Benetton's signing of Michael Schumacher. Funny thing was, though, that before Williams signed the young man from Dartford, Kent, no-one really noticed what a great talent he actually was. In 1973, Tony Brise had taken two British F3 championships, the John Player version by himself while sharing Lombard North Central honours with Richard Robarts. As Robarts signed for Brabham - where he would be replaced after just two races by none other than Rikky von Opel, that's right, the 1972 Lombard champion - Brise tried to raise enough funds to secure a works March F2 seat. It was mission impossible for the underfunded Englishman, and so he had to consign himself to a season of F Atlantic. Brise, in only his fourth year of car racing, was bred in karts and despite his cash-flow problem had the mercurial rise to the top which today seems necessary to make it to F1. As a matter of fact, Beppe Gabbiani's quick rise to F1 is another case in point but perhaps his is not a good example preceding the current trend among F1 team owners to entrust their million-dollar machinery to ever younger inexperienced go-kart teenagers - 19-year-olds Fernando Alonso and Felipe Massa the next ones to follow in Trulli and Button's shoes. Just turned 20? We're sorry but that's just to old to debut in F1! In 1971, Tony's first full season in race cars, Brise was also 19 years of age, having been in karts from the age of 8. In 1968 Brise became the British champion and continued in the category for two more years, cash-strapped as he was. Finally, late 1970, he was offered a ride in the BOC Formula Ford championship, in an elderly Elden. For 1971 he swapped it for a more competitive Merlyn and was on the pace straight away, finishing second in the championship. This had not gone unnoticed by new Brabham owner Bernie Ecclestone who offered Brise a ride in one of his BT28s. But the car wasn't up to it and a switch to a GRD greatly improved his fortunes. So for 1973 GRD's Mike Warner signed Tony for one of his works cars, replacing the F1-bound Roger Williamson. Brise said thank you by delivering two championships to Warner. Then, finally, one and a half years later, Brise drove his first F1 race in a Williams. It may not have been as good an opportunity as it would have been in 1993-'94, when Damon Hill and David Coulthard were as lucky as they were, but Tony was grateful nonetheless. The occasion rose as a result of Jacques Laffite's clashing F2 commitments, the young Frenchman preferring the damp Eifel over sunny Montjuich in his chase of the European F2 crown. So while Jacques was busy winning the Eifelrennen along with five other F2 rounds in what was to be a successful European challenge, Tony took over FW03 (now in its third year of existence, having started life back in 1973 as the Iso-Marlboro IR3 tub), Tony put a 1m26.4s on the clocks, which meant 18th place on the grid at a venue he hadn't been before. He was just one tenth shy of Jacky Ickx and Mark Donohue and ahead of Alan Jones and Wilson Fittipaldi. It was an outstanding performance. On Sunday, Brise would be the only Williams driver to take the start. Along with Emerson Fittipaldi - the man unwillingly responsible for starting off the Armco row in the first place - team mate Arturo Merzario, debuting the new Williams FW (also known as "FW04"), declined to race, withdrawing at the start with Emerson's brother Wilson, both in protest of the shambolic safety measures at Montjuich. Then, during a race in which a total of eight cars violently left the track, the last one proving to be fatal, Tony moved into sixth but then got hit from behind by Tom Pryce, forcing the Williams debutant into a lenghty pitstop. He eventually was classified seventh, just shy of Lella Lombardi's historic half point. Amidst the carnage, Brise had been scouted by Graham Hill, who had just seen his race-leading German star being taken to hospital. At Monaco, while Laffite was back in the second Williams, Hill was a single entry for his own team, Graham celebrating his last GP outing at the venue where he won five times, but sadly failing to qualify. This was the moment Hill had decided in his heart to finally quit GP racing after 17 years of loyal service. So at Zolder Embassy Racing with Graham Hill showed up with two cars again, but now had Tony Brise in the No.23 entry and François Migault returning in the No.22 seat after also having driven the No.23 car for the team at Jarama since Hill had hurt himself in a practice crash at Kyalami. His Lola T370s now both upgraded to Hill GH1s, Hill was looking for the same form Stommelen showed at Montjuich. In qualifying it seemed they found their way, Tony placing the car a sensational 7th on the grid but suffering a blown engine 17 laps into the race. Meanwhile, Migault was languishing down the grid and for Anderstorp he was replaced by Teddy Tip protégé Vern Schuppan. In Sweden, Brise also crushed his new team mate in qualifying, although his 17th place wasn't too good either - but then he had to work around two blown engines... After racing as high as 5th before his clutch started to play up he did go on to score Hill's first point in history - what was to be the only point he himself ever was to score. At Zandvoort and Paul Ricard followed two fighting 7th places. More impressively, he managed to outperform his third team mate in succession, another Australian, this one by the name of Alan Jones, in Holland by a qualifying margin of almost two seconds, and in the races by a lap at least. In Britain and Germany Brise continued to consummately outpace Jones, although the Aussie held on in the race to finish a distant fifth and earn Hill's second and third points. In qualifying on the 14-mile track Tony had been 8 seconds up on Jonesy, however. This was the time luck was turning on the Embassy Hill team. With Stommelen returning to his mount from Austria on, first they didn't figure at all at the rain-shortened Österreichring race before both crashed out within three laps of the Italian GP. With the Canada race cancelled, Tony was free to enter the first Long Beach GP, run for F5000 cars. In one of Dan Gurney's Lolas he set fastest lap and took the lead twice. Eventually the car broke but he had shown the way to some of America's greatest drivers, Big Al and Mario among them. Then he was off for his last race of 1975, having already signed on for 1976. Deciding to go with just one car, Embassy Hill showed up with Brise at Watkins Glen, Tony having gained the momentum on Rolf during the German's absence. But yet again, Brise was off the track within a handful of laps, courtesy of Brian Henton's efforts. That was the last on-track appearance of Tony Brise and the Embassy Hill. On November 29, on their return from testing Andy Smallman's new GH2 at Paul Ricard, Hill's private plane crashed on its approach to Elstree airport, at Arkley golf course, near Barnet, killing all its occupants, including Hill, Brise, Smallman and three mechanics. Tony was just 23 years old. Just as Roger Williamson and Stefan Bellof, Tony Brise was a shooting star. The speed with which he rose close to his zenith was impressive and left everyone expecting when the next British World Champion could be celebrated. In fact it would be the very next year, James Hunt rising to the occasion, but in the winter of 1975 all thoughts were still with the double World Champion and the champion-elect who had just retired to the great pitlane up in the sky. At the prize-giving ceremony following this year's Long Beach Grand Prix CART race, 7th place finisher Gil DeFerran received, along with his prizemoney, the Tony Brise Memorial Trophy. Why did he receive this trophy, who was Tony Brise, and why should he have a trophy named after him? The simple answer is that DeFerran set fastest race lap, and the Tony Brise Memorial Trophy commemorates the brilliant young driver who set the fastest race lap in the very first Long Beach Grand Prix, held for F5000 cars on 28th September 1975, and who died two months later, aged just 23, in a light aeroplane crash. Anthony (Tony) Brise was born in Dartford, Kent, in England on 28th March 1952, the son of 500cc Formula 3 racer John Brise. Tony started racing karts at the age of 8, progressing slowly at first, but eventually becoming joint British champion in 1969. Tony moved into FF1600 halfway through 1970 in an Elden, which he replaced with a Merlyn halfway through the following season, ending the year second in the BOC British FF1600 Championship. Moving up to F3 in 1972 with a semi-works Brabham, Tony's results were disappointing until he switched to a more competitive GRD chassis. This was enough to gain Tony the works GRD F3 drive for 1973. Although involved in the occasional shunt, Tony was the class of the British F3 field, winning the John Player Championship, and becoming joint champion of the Lombard Championship. Tony also found the time to finish 2nd in the Monaco Grand Prix F3 support race! 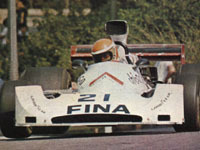 Despite his success in 1973, and the subsequent well-earned Grovewood Award, Tony's career almost ground to a halt in 1974, when lack of finance forced him to abandon plans for an European F2 campaign, but F2's loss was Formula Atlantic's gain when Tony slotted a Holbay-tuned FA engine into a second-hand F3 March and went racing! A massive crash at Snetterton wrote the car off, but Tony had done enough to earn himself the works Modus Atlantic drive. The Modus was also a converted Formula 3 car, and so ran on old F3 tyres, no match for the new F Atlantic rubber. Nevertheless, Tony's talent shined through and he put up many spirited performances, including the occasional win. The highlight of Tony's year, though, must have been his marriage to Janet, a long-time motorsports fan who became Tony's greatest supporter (for their first wedding anniversary present, Tony gave Janet a stopwatch!). Tony continued with the works Formula Atlantic Modus outfit in 1975 (this time with a purpose-designed FA car). He was outstanding early in the year, with six consecutive wins! It was during this winning streak that Tony's Grand Prix opportunity arose. Williams F1 driver Jacques Laffite (the man who beat Tony in the 1973 Monaco F3 race) had committed himself to a full season of European F2, and as the Spanish Grand Prix clashed with an F2 round at the Nurburgring, Frank Williams needed a replacement driver, so why not try the young Englishman who was winning so often in Formula Atlantic. The Spanish Grand Prix meeting turned into a total disaster. The Grand Prix was held on the tight and twisty road circuit around Monjuich Park in Barcelona. This circuit featured four hairpin turns and considerable change in elevation with several blind crests within it's 3.8 kilometre lap. When practice was due to begin on Friday, it was found that the standard of Armco barrier was appalling, with most of the securing bolts loose, and many missing altogether. Naturally the G.P.D.A. (Grand Prix Drivers' Association) protested, and the only drivers who actually practised were Jacky Ickx and Vittorio Brambilla, before on-track activity was abandoned for the day. Overnight, workmen were called in to improve the situation, but by 11 am on Saturday morning the Armco was still far from satisfactory and personnel (including drivers!) from most of the F1 teams joined in the work. Despite this, most GPDA members were unimpressed, and it appeared that the race would not go ahead. This prompted the event organisers to threaten to impound all of the cars. Naturally, this inspired the team owners to persuade the drivers to get on with the job. This they did, although some drivers made their feelings on the matter apparent, notably reigning World Champion Emerson Fittipaldi who did three very slow lap with one hand held aloft. Tony Brise, at his debut Grand Prix, naturally kept his head down and qualified comfortably in 18th, ahead of fellow GP debutantes Roelof Wunderink, and future World Champion Alan Jones. Come raceday, Emerson Fittipaldi decided to boycott the race, and flew home to Switzerland, while everyone else, however unhappily, came to the starting grid. The race started with a multiple shunt, and steadily become worse. Due a combination of attrition and careful, precise driving, by lap 19 Tony had moved up into sixth place behind Rolf Stommelen, Carlos Pace, Ronnie Peterson, Jochen Mass and Jacky Ickx, and ahead of Welshman Tom Pryce. On the following lap, however, Pryce got too close at one of the hairpins and hit the back of Tony's Williams, putting both cars in a spin. Pryce retired a few laps later due to damage from the collision, while Tony continued after a lengthy pitstop having his FW03 checked for damage. Shortly after Tony rejoined the race, tragedy occurred when Stommelen's leading Embassy Hill Lola crashed heavily just after the blind crest following the startline, Rolf's car vaulting the weak barrier and hitting and killing three race officials and a photographer, and inflicting serious leg injuries on it's hapless driver. Chaos ensued, and it was another four laps before the race was red-flagged, Tony bringing his Williams home in 7th place of the eight classified finishers, two laps behind Jochen Mass' winning McLaren. The race was not re-started, and so half-points only were awarded, the first time that this had occurred. Additionally, Lella Lombardi came home sixth, becoming the first, and only, woman driver to record a top-six finish in a World Championship Grand Prix. With Laffite returning from his F2 duties, it was back to Formula Atlantic for Tony, although he was at the next Grand Prix meeting at Monaco... driving a Modus in the F3 support race! Although Tony didn't win, he did set fastest race lap, whereas Laffite failed to qualify for the F1 Grand Prix. Perhaps Frank Williams should have learn from this, but he apparently didn't, as when Tony Brise made his return to F1 at the next Grand Prix, the Belgian at Zolder, it was behind the wheel of an Embassy Hill Lola. After Stommelen's serious injuries at Monjuich Park, Graham Hill (having given the Spanish Grand Prix a miss) returned to the cockpit at the circuit at which he had won five times, Monaco. He failed to qualify and decided there and then to retire from racing (although he didn't publicly announce his decision until later). The obvious choice to replace himself in the cockpit (and a very popular choice in Britain) was Tony Brise. Amazingly enough, Tony qualified an outstanding 7th, ahead of such recognised F1 stars as Emerson Fittipaldi, Jody Scheckter, James Hunt, Ronnie Peterson and Jacky Ickx. Tony qualified 15 places ahead of team-mate Francois Migault, a difference of more than three seconds! Tony made a good start, maintaining his 7th place, but spun on the third lap and dropped almost to the very back of the field before re-joining. Unfortunately, the heavy-revving he gave the engine as he re-joined may have contributed to his Ford Cosworth engine blowing on lap 19. Despite having secured a Grand Prix drive for the remainder of the year, Tony decided to finish his Formula Atlantic season with Modus, although obviously his championship hopes were compromised by Grand Prix commitments. Tony's third Grand Prix was the Swedish. He didn't qualify as well at Anderstorp as at Zolder (he lost track-learning time due to two blown engines! ), and he started down in 17th, but he again out-qualified his team-mate, on this occasion experienced Aussie Vern Schuppan, this time by 9 places, almost 2 seconds. Tony had never completed a race of full Grand Prix length, but drove an outstanding race, pacing himself behind Jochen Mass in the early stages, but building up his pace in the second half of the race, passing Mark Donohue to move into eighth, then Ronnie Peterson, and putting himself into the points by passing John Watson on lap 56 (of 80). Better was still to come as he forced Emerson Fittipaldi's McLaren aside to move into 5th place five laps later. Unfortunately Tony's Hill Lola then developed a very difficult clutch, which eventually failed completely, finally jamming his gearbox in 4th gear (on a circuit with four hairpins!) in the closing laps, causing Tony to drop back to sixth place at the finish, to score his well-deserved first World Championship point. On to the Dutch Grand Prix at Zandvoort. Tony had another new team-mate, the tough Australian Alan Jones. Tony easily out-qualified Jones, started the race an excellent 7th on the grid, ten places (over a second) ahead. The race start had been delayed due to a rain shower, and everyone started on wet tyres, although it had actually stopped raining by the time that the Grand Prix finally started. Tony made a slow start, and dropped several places, coming around in 12th position at the end of lap one. Tony lost more time with a slow pitstop (all the cars switching to dry-weather slicks between laps 7 and 15), and spent the rest of the Grand Prix playing catch-up, eventually coming home 7th of the 14 finishers, just missing out on a second WC point. Tony had the same team-mate, Alan Jones, for the French Grand Prix at Paul Ricard, and again out-qualified the Aussie, this time by almost two seconds (8 places), Tony lining up 12th on the grid. He made a good start, and moved up quickly and by the 9th lap was running strongly in 7th place, knocking on the door of the point-scoring positions. But the Hill Lola was no match aerodynamically along the Mistral straight for Andretti's Parnelli or Depailler's Tyrrell, and despite Tony out-driving the pair of them around the twiddly bits, both came past, but thanks to a couple of other drivers hitting trouble, Tony finished seventh for the second consecutive GP. The British Grand Prix was held at Silverstone in 1975, so Tony was unable to make his British GP debut on his home circuit of Brands Hatch, but even so, the Kentish man had a warm reception at the Northants racetrack. 13th on the grid, he out-qualified team-mate Jones by seven places (0.78 seconds). Tony made a good start, and started to carve up through the field, passing Brambilla, Reutemann and Andretti, and was running in eighth place when a rear wheelnut started coming loose on lap 12, Tony trailing into the pits to have it tightened up, losing a huge amount of time. He was then unlucky enough to be the first to hit the standing water at Club in the infamous multi-car spin-off in the race's closing stages. Tony was hit on the head by a catch-fencing post, which damaged his helmet and inflicted some facial abrasions which required hospital treatment. He was classified 15th. Tony out-qualified Jones by almost 8 seconds at the German Grand Prix, but as it was held at the 22.8 km Nurburgring, that only translated into 4 grid positions, Tony 17th, AJ 21st. He completed the first lap in 14th place and moved up steadily as accidents gradually accounted for most of the field, and it was an accident which took out Tony too, a rear suspension radius rod detaching itself on the 10th lap. This was Tony's second crash of the weekend after writing-off his usual race car in practise when one of his Goodyear's punctured. Stommelen was back in the team for the Austrian Grand Prix, but Tony confirmed his status by out-qualifying the German by nine places (almost 2 seconds). Tony started well and, in difficult wet conditions, he quickly moved up from his 16th place on the grid to 9th place in the race, but lost a balance weight from a wheel causing such a severe vibration that he had to stop at the pits on lap 14 to have the wheel replaced. Another slow pitstop by the Embassy Hill boys meant that Tony re-joined a lap down, and he finished the rain-shortened race in 15th position. Tony achieved his best-ever starting position at the Italian Grand Prix at Monza when he lined-up 6th, 17 places (three seconds) ahead of Stommelen. Raceday was a disaster, with Tony making a terrible start, losing several places, and then trying to make them up by leaving his braking ultra-late for the chicane on the second lap. Too late, in fact, as he half-spun, and ended up sideways across the chicane entry. He managed to re-start after everyone had bumped and swerved their way past, but someone had made contact, and Tony was forced to retire with damaged suspension. With the Canadian GP being cancelled due to a financial dispute between the organisers and the FIA, only one World Championship round remained, at Watkins Glen. Therefore, Tony was free to accept an invitation to race an AAR-run Lola in the inaugural Long Beach Grand Prix, held for F5000 cars. Tony was outstanding, and obviously unawed by the established American stars. He literally nudged Al Unser snr out of the lead on the third lap. He then spun the lead away, dropping to third, but fought his way back into the lead with a brilliant dive down the inside of Mario Andretti at the hairpin. Tony's Lola eventually broke, but he had set the fastest lap of the race, and impressed everyone with his outstanding car control. Graham Hill had decided to concentrate on just one car for his 1976 team, and so Rolf Stommelen had been let go, making Tony undisputed teamleader for the U.S. Grand Prix. Tony qualified 17th and had a short race, Brian Henton spinning his Lotus ahead of Tony on the sixth lap, and plucking off the Lola Hill's right rear wheel as he took avoiding action. Tony had agreed to stay on as Embassy Hill's driver and the team had an interesting new car in the wings, the Andy Smallman designed Hill - Ford Cosworth GH2. Tragically, the fates decreed that the GH2 was never to turn a wheel in anger. On the evening of the 29th of November 1975, returning from a test session at Paul Ricard in the south of France, ex-double World Champion Graham Hill, piloting his own light aircraft, lost his bearings in dense fog approaching Elstree airfield and crashed on Arkley golf course near Barnet in North London, killing himself, driver Tony Brise, designer Andy Smallman, and mechanics Ray Brimble, Tony Alcock and Terry Richards. A terrible end of a promising young British Grand Prix team, and a brilliant young British Grand Prix driver. Tony Brise was only 23, and was survived by his wife, Janet. He is remembered with fondness by everyone who ever saw him race.